To succeed in content marketing, you need to be in for the long term. With direct response marketing, ROI can be measured in weeks or months. With content marketing, however, it can take a year or more to see a return on your efforts. 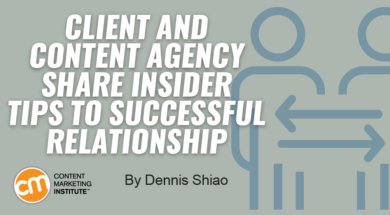 When hiring a content marketing agency, brands ought to plan for a long-term relationship. Alenka Bester, head of digital content marketing at Zavarovalnica Triglav, and Nenad Senic, brand editor at PM, poslovni mediji, discuss how in a presentation at Content Marketing World, Client-Agency Collaboration: How to Evolve Together to Deliver Content Marketing Results. Alenka and Nenad share their journey of working together, along with advice on achieving success in the client-agency partnership. As with any relationship, success is difficult when competing interests are at play. If you want “x” and I want “z”, we’ll probably end up butting heads and achieve neither. “For a successful, long-term relationship, you need to determine common goals. (The) agency’s goals should be aligned with (the) client’s goals,” says Alenka. Brands have relationships with numerous agencies – advertising, SEO, paid search, social media marketing, and more. Alenka knew she had to think differently about the relationship with a content marketing agency. Her organization typically works with agencies on two-year contracts for an associated campaign. For new campaigns, the company reopened the bidding process. “The conventional contract arrangements wouldn’t work for us because we would never be able to achieve consistency as a series of campaigns,” Alenka says. She bent a few internal rules to establish a permanent contract with a content marketing agency, while limiting the scope of work to specific content marketing projects. “The contract enabled us to set up a functioning, consistent program around a content hub supported by email and social media distribution,” Alenka says. The contract was signed with Nenad’s agency. Success results from a focus on the audience, not on you or the brand. Agencies need to think about both the client and the client’s audience. Agencies should understand the client’s audience better than the audience members know themselves, Nenad says. Sometimes the agency needs to put the audience ahead of the client – questioning the client, for example, on whether a new initiative properly serves the audience. “The agency’s job is to always ask ‘why,’’ Nenad says. When the client has some big ideas, you must ask them why they want to do them. Do they serve the audience? You must ask questions and sometimes persuade them to go a different route, he says. When client and agency establish common goals, they become part of the same team. Some clients, though, still keep agencies at arm’s length, Alenka says. They hesitate to share information, fearing it exposes them or that the agency will use it to sell them more. They view the relationship as transactional – what can you do for me and when can I have it. “I strongly believe that this is a highly collaborative process where you only get what you give. Both of you, the agency and the client, need to share information and get involved to get the best results,” she says. She finds it useful and productive to share her ideas with the agency. “What works best for us is if I can make room for creative discussions, where I sit down with Nenad and talk openly about my ideas and my visions. I know that he won’t try to immediately sell me something but will take those ideas and bring them to a whole new level,” Alenka says. In any team environment, personalities can clash. One person thinks differently from another. They find it difficult to communicate. This disconnect led to crisis meetings, which involved a lot of yelling. It wasn’t pleasant for either party. Nenad removed himself from the relationship and put a colleague in charge of the client’s account. The colleague’s personality meshed much better and the crisis was averted. Nenad shares another story in which the agency was slow to address personality conflicts and eventually lost the big client. It’s fine to shake up the team to support the client’s success. The key is to act quickly and decisively. Rarely does an agency have the subject matter experts in a client’s industry. They are experts in content. He needs to know how to find people who are the experts. Clients shouldn’t expect their agencies to be experts. “In a complex industry, it’s unreasonable to expect that the agency will understand all the fine print, all the intricate details of your products. They will learn, of course, but only if we help them. If we share our expertise, not look down on them,” Alenka says. But clients have an essential role to play with subject matter experts. “I, as the content marketer am the intermediary between the agency and our subject matter experts. I prevent the ping-pong between the two parties. It’s stressful sometimes, but important,” Alenka says. Reading all these useful tips from Alenka and Nenad, you can see their strong client-agency relationship. They continue their long-term partnership today, collaborating for a successful content marketing program. What do you think? What’s your perspective as a client or an agency? What works well? What didn’t work? Check out the agenda for this year’s presenters at Content Marketing World. And make plans today to attend the Sept. 3-6 event in Cleveland, Ohio. Register using code BLOG100 to save $100.